"Lactaid® Mint Chocolate Chip Ice Cream is thawed, mixed with mini chocolate chips, poured into a chocolate pie crust, refrozen and served with chocolate syrup on top. A luscious frozen dessert everyone will love, and with lactose-free ice cream it's a rich dessert everyone can eat too." Place about 30 chocolate wafer cookies in a blender; pulse several times until they are roughly the size of small peas. Add melted butter; pulse until mixture resembles coffee grounds. Pour crumbs into pie pan. Press with the back of a spoon over the bottom and up the edges of the pan. Bake in preheated oven 10 minutes. Cool. Remove ice cream from freezer to thaw at room temperature, about 1 hour. Pour very soft ice cream into a bowl. Mix in chocolate chips; stir until well combined. Pour ice cream mixture into cooled pie crust. Freeze until set, at least 1 hour. 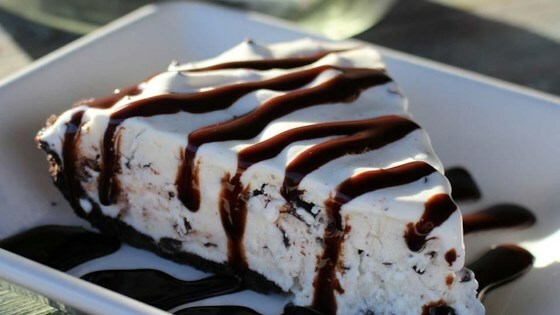 Serve pie wedges with a drizzle of chocolate syrup. The name is pronounced Mee Cho Chee.